QUEZON CITY – Karapatan today joined Kilusang Magbubukid ng Pilipinas (KMP) in filing a complaint at the Commission on Elections for the removal and/or cancellation of registration of Abang Lingkod partylist. The complaint was filed by Wilfredo Marbella, Deputy Secretary General of KMP and Marie Hilao-Enriquez, Karapatan chairperson. The complaint included a petition to deny due course and/or cancel certificate of nomination. Paduano, along with Patrick Leonard S. Lacson, Provincial Board Member of Negros Occidental were named defendants of the complaint. RPA-ABB has been involved with numerous cases of human rights violations, specifically in Negros Occidental and Oriental. It is widely known that RPA-ABB now functions as a paramilitary group. MANILA – For as low as P5,000, Filipinos may now invest in BahayBonds, said Vice President and Housing and Urban Development Coordinating Council chairman Jejomar C. Binay. The housing czar urged Filipinos to avail of the BahayBonds Series 2 (BB2) as a safe and profitable investment alternative. "This is a great way to induce Filipinos to start saving, especially in light of the recent Bangko Sentral survey that most heads of Filipino households do not save," the Vice President declared. The invitation to retail investors followed the announced issuance of P600 million worth of BB2 classified as Residential Mortgage Backed Securities mid-August of this year by the state-run National Home Mortgage Finance Corporation (NHMFC). According to Binay, who also sits as Chairman of the NHMFC Board of Directors, the BahayBonds2 shall be the first-ever Retail Housing Asset-Backed Securities in the Philippine market. It shall be backed up by an asset pool composed of high quality accounts from the Corporation’s prime assets. The BB2 targets retail investors and are designed to be a safe, high yielding and affordable savings instrument. "With a 4.80% interest rate, the bonds are higher than most interest rates on bank deposits. Coupled with a tax-free guaranteed return, this first retail mortgage bond would be the most attractive investment for individual investors who want to maximize their profits," Binay said. "This is a good venture for overseas Filipinos, government employees, or every common Juan who do not save because they are not enticed by the interest rates offered by traditional institutions like banks," he added. The BB2 offers the privilege of free ATM-accessible savings accounts and the convenience of balance inquiry through internet and phone banking facilities both with Land Bank of the Philippines (LBP). Moreover, its current market value is readily available due to Philippine Dealing Exchange listing and instant loan facility against latest market value. “As a bonus, house and lot units will be raffled for active accounts,” Binay said. The Bangko Sentral ng Pilipinas considered BB2 as risk free because the securitized loans guaranteed by the Home Guaranty Corporation carry the sovereign guaranty of the Republic of the Philippines. The transaction is classified into three tranches. Majority of the issues classified as Class A Senior Notes shall be sold to retail investors, Class B Senior Notes shall be sold to qualified institutional investors while Class C Subordinated Notes shall be kept by NHMFC. Binay said that this structure provides greater assurance of safety and payment to the retail investors. The public offering of the bonds was opened on July 26, 2012. Retail investors can subscribe to BB2 through any branch of the LBP, which serves as the selling agent. Also, in a related statement, the Philippine Rating Services Corporation (Philratings) announced that BahayBonds2 Securitization Issue will be getting a conditional credit rating of PRS Aa for both the P300 million Class A Senior Notes and the P120 million Class B Senior Notes. A conditional credit rating of PRS Baa, on the other hand, was given to the P180 million Class C Subordinated Notes. Obligations rated PRS Aa are of high quality and are subject to very low credit risk while obligations rated PRS Baa exhibit adequate protection parameters. CATBALOGAN CITY – Inspired by the success of the job fair that took place during the Independence Day Celebration on June 12, 2012, the Samar Provincial Government will hold another job sequel on August 8, 2012 at the Samar Covered Court, Capitol, Catbalogan City. Samar Governor Sharee Ann Tan and the Department of Labor and Employment (DOLE), TESDA, and other partner agencies decided to conduct another job fair entitled “Handog Trabaho Para sa Samarnon”. The Samar Job expo held in June 12 drew positive feedback from the labor sector of the province. Some eight overseas recruitment agencies brought 2,914 job orders. Some 531 job applicants who came from the different municipalities/cities of the province patronized the Samar Job Expo, of this number, 51 were hired on the spot, 16 of these were hired for overseas employment while 35 job seekers were hired locally. “The percentage of employment was very low since the job seekers were not ready with their requirements and personal documents to support their application,” said Anita Taran, organizer of the Job Expo. To allow more Samarnons to find jobs, the Public Employment Service Office (PESO) will hold this job fair to give chances to the applicants who had incomplete requirements and documents. “This is open to all Samarnon job seekers,” said Maica Fulgencio from the PESO. In an interview at PIA 8 Huruhimagraw radio program on Thursday, Fulgencio explained the documents that the applicants need in the job fair. Basically, recruitment agencies require the applicants to bring biodata, 2x2 pictures, certificate of employment, diploma or transcript of records (TOR), and authenticated birth certificate. During the Job Fair, TESDA programs and services will be showcased on the side. TESDA will give free services like computer clinique, troubleshooting/repair of computer hardware. For the TESDA specialista technopreneurs, there will be a health and wellness corner, free taking of blood pressure and free massage. CAMP RUPERTO KANGLEON, Palo, Leyte – PNP PRO 8 commends the sustained intelligence build-up of PNP Stations leading to the arrests of Other Wanted Persons here in the region and its continues information networking with the public in reporting outlaws aligned to the nationwide implementation of LOI “MANHUNT CHARLIE” – PNP’s campaign against wanted persons forming part of the Ten (10) Point Action Plan of the Chief PNP in accounting of wanted persons thru service of warrants. On July 23, 2012, an anonymous tip through the Maasin City Police Station led by PSInsp Marianito P. Malibago, Intel Officer resulted to the arrest of one Henry Laroa Arbiol, 27 years old, married, farmer and a resident of Barangay Combado, Maasin City, Southern Leyte. Arbiol is wanted for the crime of violation of Section 3 of RA 9287 (Illegal Gambling) and arrested by virtue of a Warrant of Arrest issued by Honorable Daisy Paler Gonzales, Presiding RTC Judge of Branch 25, Bulwagan ng Katarungan, Maasin City with recommended bail of P20,000.00. At about 10:30 in the evening on July 25, 2012 at Barangay Palanog, Tacloban City, elements of Police Station 2, Tacloban City Police Office led by PSInsp Francisco T. Calumba, Jr. arrested a certain Richard Donsa Roncales, 17 years old, single, and a resident of said place. The 17 years old Roncales was arrested by virtue of a Warrant of Arrest for violation of PD 1619 (Unauthorized Use/Sale to Minors of Volatile Substances) issued by Honorable Sylvia Lamoste, Presiding MTC Judge, Branch 1, Tacloban City. Another wanted person was arrested by Allen Police Station led by PCInsp Arcilla W Andales, chief of police, at about 3:00 o’clock in the afternoon on July 24, 2012. Arrested persons were identified as Rolito Fortuno Rufin, Sr., 56 years old, married, a businessman and one Reynaldo Cascaño Pollente, 36 years old, married, a laborer and both are residents of barangay Jubasan, Allen, Northern Samar. The two (2) were charged for Frustrated Murder docketed under Criminal case Number A-2711 issued by Honorable Manuel F. Torrevillas, RTC Branch 23 Presiding Judge, Allen, Northern Samar with recommended bail of P24,000.00. Subject persons were brought to their respective Police Stations for documentation and proper disposition. According to PSSupt Roel Balintong Acidre, Chief RPCRD stresses that these notable accomplishment bespeaks not only of the dedication of the involved personnel to their sworn duties, but also of the firm resolve of the PNP organization to ensure that fugitives of the law must be arrested so that justice will be served. And anyone with information on criminal acts of lawless elements is advised to please call or visit your nearest police station for immediate action. QUEZON CITY – Group of ex-political prisoners SELDA (Samahan ng Ex-Detainees Laban sa Detensyon at Aresto) condemned the court’s decision to grant bail to former Pres. Gloria Macapagal-Arroyo. “Pres. Aquino was right, the Philippines is not a joke. The joke is that we allow electoral saboteurs to be freed, while political dissenters are the ones imprisoned,” SELDA secretary general Angelina Ipong said. Ipong said they are not at all confident that the Aquino government will push through with charges against Arroyo, saying it has always been playing safe when it comes to holding the former president accountable. “This government has no real sense of justice. It cannot even arrest Palparan. Worse, it cannot own up to its own human rights record. In fact, Malacañang has to lie on the existence of political prisoners to claim it is a defender of human rights,” Ipong said. The group successfully ended the week-long fasting and hunger strike of political prisoners in the country from July 16-23. Almost 700 political and non-political prisoners participated in the fasting and hunger strike. SELDA has long criticized Pres. Aquino of his blatant disregard on the plight of the political prisoners or human rights in his SONA, saying that the government is blatantly covering up the existence of political prisoners. “He has the gall to tell the nation that he is a victim of Martial Law, but repeats the same fault of criminalizing political dissent,” said Ipong. “As long as there are political prisoners, and the likes of Arroyo and Palparan roam freely, we shall continue to demand for their freedom, and jail those who wronged the people,” Ipong ended. CAMP RUPERTO KANGLEON, Palo, Leyte – The PNP PRO 8 leadership commends the successful operation launched by the operatives of Mondragon Police Station leading to the arrest of a man wanted for Murder and rank number 5 in the list of its Most Wanted Person Municipal Level. At about 5:00 AM on said date, elements of Mondragon Police Station led by PInsp Aldin E. Dugan, chief of police, arrested one Alfredo Acibar Aguilando, 55 years old, married, farmer and a resident of Barangay Bugko, Mondragon, Northern Samar. Aguilando was arrested by virtue a Warrant of Arrest for the crime of Murder docketed under Criminal case Number 4695 with no recommended bail issued by Honorable Judge Norma Megenio Cardenas, Presiding Judge RTC Branch 19, Catarman, Northern Samar. Said arrested person is rank number 5 in the list of Most Wanted Persons in the municipality of Mondragon, Northern Samar. Meanwhile, the Gandara and Catbalogan Fire Department was dispatched to Tarangnan fire incident at 1:45 in the afternoon, Tuesday, July 24, 2012. Firefighters arrived on scene and found fire at the residence of a farmer, a certain Loreto Abantao Mabonga located at barangay Balugo, Tarangnan, Samar. Firefighters quickly extinguished the fire which lasted for about 35 minutes. And the elements of Tarangnan Police Station led by PInsp Jonathan Contapay also provided area security. A faulty electrical wiring caused the fire with estimated damage cost value of P50,000.00, Gandara Bureau of Fire Protection discloses. TACLOBAN CITY – The Eastern Visayas Regional Office of the Department of Agriculture solicited technical support from the Central Office, for the operationalization of its Information Strategic Plan. The call was made by Regional Technical Director Wilson A. Cerbito, Region 8’s Unified Enterprise Geospatial Information System (UEGIS) Project Manager, during the recent roundtable discussion among the DA 8 officials and the officials of the Information Technology Center for Agriculture and Fisheries (ITCAF) of the Department of Agriculture (DA)-Central Office. “We are very thankful to ITCAF for prioritizing Region 8 and for extending the necessary technical expertise in the implementation of the National Farmers Registry System (NFRS) and the Inventory System on Agriculture and Fishery Investments (ISAFI). That is why we would like to maximize the available inputs provided to us by the ITCAF experts and take advantage of their presence to operationalize the information strategic plan for Region 8,” RTD Cerbito said. In response, Director Gary Glenn Fantastico of DA-ITCAF said he is happy that DA-8 and DA Central Office are working together to realize the goal of maximizing the use of information technology for a more effective and efficient data collection, processing, analysis and dissemination. Dir. Fantastico assured the DA-8 officials that ITCAF will provide the needed technical capabilities to realize their vision of an enhanced information system for Eastern Visayas. “First, we have to conduct a systems inventory to determine the system requirement for Region 8,” Director Fantastico said. He also revealed other information technology-generated projects that can be adopted by DA-8 such as the online reporting system which could help speed up the exchange of information within the organization. RTD Cerbito informed that DA-8 officials have to meet again with the DA Central Office ITCAF experts to finalize the proposal for the said project. At present, DA-8 has already completed the physical structure of its P1.3 million-worth UEGIS laboratory fully furnished with internet connected computers and other hardware for a secured and systematic embankment and processing of NFRS and ISAFI data. “As of today, we are still working on the expansion of the internet connection to complete the system,” RTD Cerbito informed. The Joint DA-8 Information and Communication Technology (ICT)-Management Information System (MIS) and UEGIS Roundtable Discussion was held on July 19, 2012 at the Leyte Park Hotel, Tacloban City. The UEGIS project is an effort of the Department of Agriculture through the Information Technology Center for Agriculture and Fisheries (DA-ITCAF) which is mandated to establish the National Information Network (NIN). Ultimately, it aims to establish a common spatial database infrastructure deployed in an enterprise GIS architecture. With the enterprise GIS as an extensive structure, it is envisioned that the entire DA can be linked through various geospatial information and services where users of the implementing entities can use, analyze, manage and share spatial data in the pursuit of their mandates. The development of the UEGIS will improve the capability of the agriculture sector in the planning and implementation of programs and projects. In the meantime the focus is on the updating of the various thematic maps through high resolution satellite imageries and establishment of geospatial database of agricultural resources information, agri-socio and agriculture/fisheries infrastructure and support services organized in a GIS environment for easy retrieval, analysis and generation of outputs. Specifically the project has four components namely: development of spatial database as well as the development of the National Farmers’ Registry System (NFRS) and the Inventory System of A&F Investments (ISAFI); ground thruthing through participatory mapping using high resolution satellite imageries; institutional and capability building of DA staff in data generation, analysis and geospatial technology; and formulation of an Integrated Development Plans of the agriculture sector. BRGY. MAGSAYSAY, Lope de Vega, Northern Samar – In an effort to promote the current Internal Peace and Security Plan (IPSP Bayanihan) of the Armed Forces of the Philippines, the 20th Infantry (We Lead) Battalion, under the leadership of LTC Noel A. Vestuir GSC (INF) PA has conceptualized a cultural presentation aimed to portray the true spirit of Bayanihan. The presentation is in a form of a variety of folk, modern and cultural dance as well as the rendition of the 8ID original song entitled “Sundalong Pilipino” being performed by organic personnel of 20IB. The primary objective of the presentation is to promote the current activities of Army Units in the province in consonance with the IPSP Bayanihan in order to instill awareness among the stakeholders in the area of operations. The presentation also aims to generate the support of the stakeholders by performing during town, city or barangay fiesta celebration while the dance troupe provides entertainment to the audiences in a unique manner. Patterned after the Philippine Army’s Guerilla Theater concept during the early 90’s, the presentation of 20IB Bayanihan Dance Troupe was crafted in order to advocate the IPSP “Bayanihan”, generate stakeholders’ support, promote peaceful solution to the conflict in the conflict-affected areas and showcase of the talents of our soldiers. The 20IB Bayanihan Dance Troupe first performed during the Miss Teen Tinambacan Pageant in Tinambacan District, Calbayog City conducted last May 2, 2012. The said performance has earned praises and admiration from the organizers, spectators and the entire crowd of the audiences. After that glaring performance, the 20IB Bayanihan dance troupe next performed during the annual town Fiesta celebration of Lope de Vega, Northern Samar last May 25, 2012. The people were amazed on the cultural performance presented by the 20IB since it is their common belief that soldiers are only doing activities related to combat. With that outstanding performance, the dance troupe was again set to perform during the 47th Founding anniversary of the province of Northern Samar held last June 17, 2012 at Catarman Freedom Park. Emotions poured out from the spectators as they applaud the performers while they illustrate the military endeavor of pursuing peaceful resolution of conflict through “Bayanihan” in a genre of fabulous presentation. According to LTC Vestuir, 20IB chief, “The presentation has showcased the true culture of the Filipinos in helping each other as exemplified in the bayanihan. The performances of the soldiers have also developed the cultural consciousness among the Warays in the province considering that it also featured one of the famous and original “Curacha” dance of Samar Island. 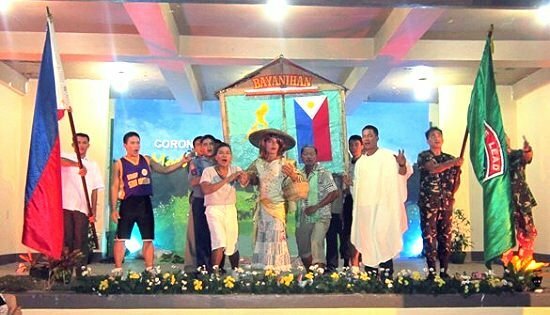 Most significantly, the performance of the 20IB Bayanihan Dance troupe exemplifies a unique way of advocating the IPSP Bayanihan and the Army Transformation Roadmap (ATR) while providing entertainment to the populace in the area”, Vestuir concluded. CATUBIG, Northern Samar – In line with the National government outreach program on the campaign of zero waste management and to sustain the gains of the unit’s in Community Relation activities thrust, 63rd Infantry (Innovator) Battalion, 8th Infantry Division, Philippine Army under the able leadership of LTC Dante R Barotilla donated more or less seventy (70) trash cans to the different Municipal and Barangay Halls, Churches, Hospital and Elementary and High Schools in the 2nd District of Northern Samar particularly in the municipality of Las Navas, Catubig, San Roque, SilvinoLubos, Pambujan and Mondragon. Some of the recipient of the said trash cans donation are the Catubig District Hospital, Catubig and Las Navas Catholic Church, Barangays of Balnasan and Coroconog of San Roque, Barangays Taylor, Mc Arthur, Del Pilar, Dapdap, Tagan-Ayan, Roxas, Geguinta and San Andres of Las Navas, Barangay Canjumadal of Pambujan, Barangays of Cagdao and Gusaran of Silvino Lubos and more or less fifteen (15) Secondary and Elementary Schools in the area such as Fair Gems Academy, Opong Elementary Schools of Catubig and others. 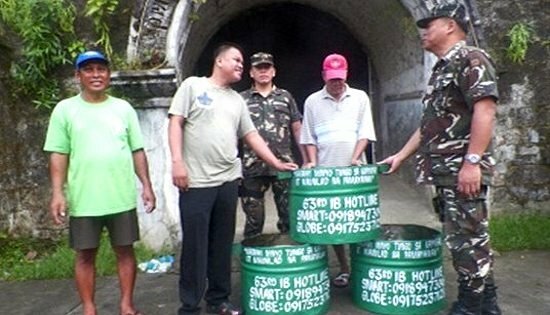 The recipient of the said trash cans particularly those who benefited expressed their deepest gratitude to the Officers and Men of 63rd Infantry (Innovator) Battalion, 8ID, PA based at Brgy. Opong, Catubig, Northern Samar led by LTC Dante R Barotilla, Commanding Officer for the simple yet meaningful and timely donation of trash cans extended to them. Said trash cans will be a great help in proper segregation of waste materials and garbages in the maintenance of the "3 R’s" reduce, reuse and recycle, classify waste management strategies of the government. LTC Barotilla said that the Officers and Men of 63rd Infantry Battalion under his leadership will always be a partner of the community particularly in the 2nd district of Northern Samar as their area of operation in pursuit to a Clean and Green environment. He also encouraged everyone to do their share in pursuit to a zero waste community in the province.